Itâ€™s Saturday evening, and youâ€™ve arranged to go for a run, bright and early the following moroning. Having checked what David Fish is saying about the weather, then having made up your own mind as to whether or not there will be a hurricane, you go out to check the bike over. 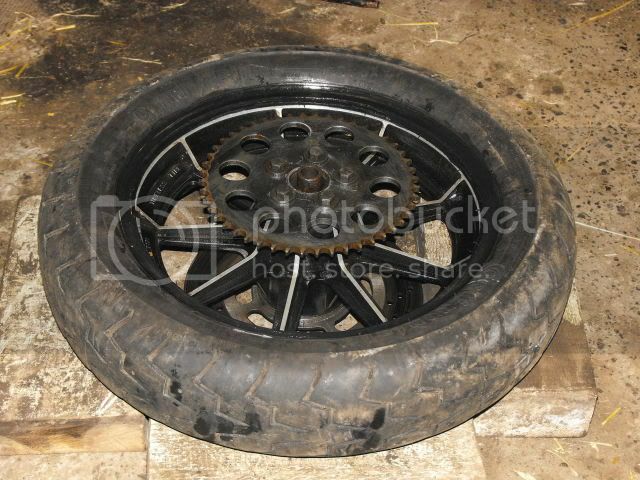 Horror of horrors, youâ€™ve got a flat in your tubeless tyre, mounted on expensive cast alloy wheels. The usual thing is to whip it down to the bike shoppe and get their trained monkee to do the dirty graft for a poultry fee, but the shoppe is closed. Tarnations! 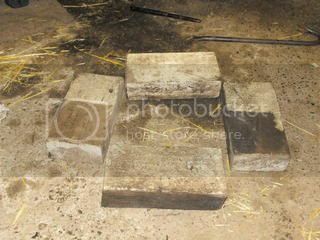 This means one will have to, finally attempt to do the task ones self, hereâ€™s how. 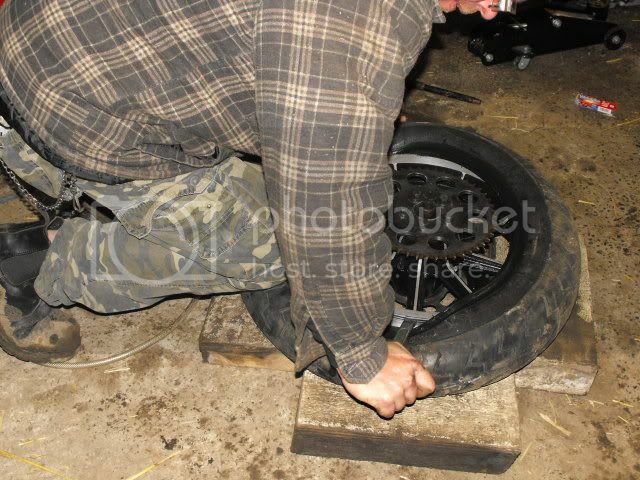 Set out some wooden blocks, upon which to rest the wheel rim, whilst keeping the sprocket/disc clear of the deck. 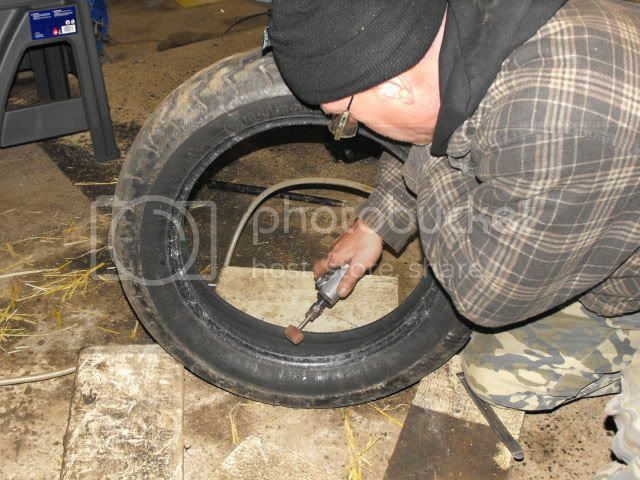 Once the bead has been broken from the seat, work around the tyre until all of one side is freed off. 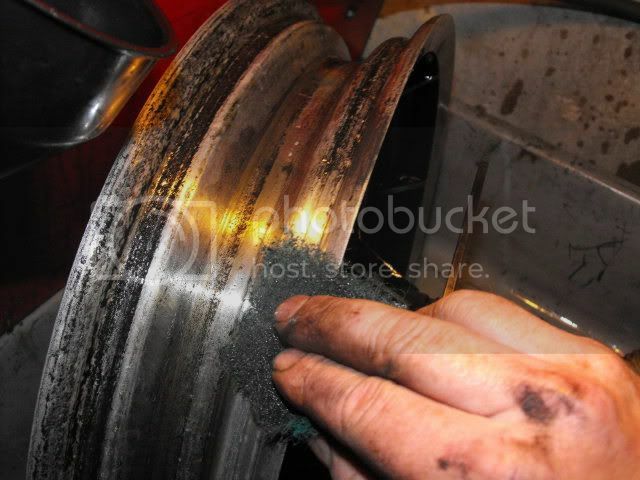 Then turn the wheel over and free off the other bead. 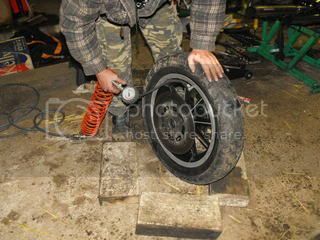 With both beads unseated, then one can start to work the tyre over the rim, start with the tyre levers a couple of inches apart, and using one to hold the tyre in place, use the other to lever the bead over. As more bead is worked over, it becomes easier, until all of one side is done. 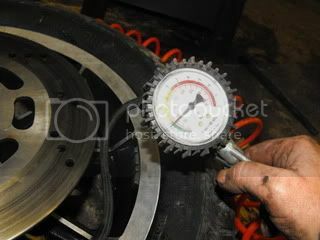 It is then fairly easy to pull the wheel out of the tyre. 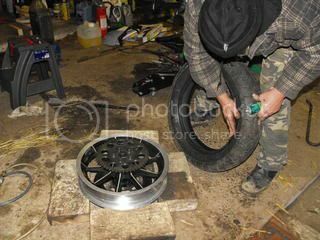 Whilst waiting for the solution to cure, set the wheel aside for cleaning, this is important, as it will make refitting the tyre a piece of piss. 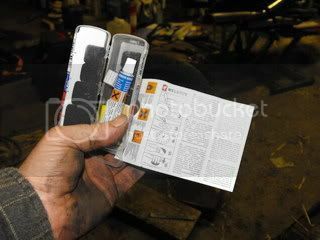 To aid tyre fitting, and in the absence of â€œtyre soapâ€, silicon grease makes an excellent lubricant. 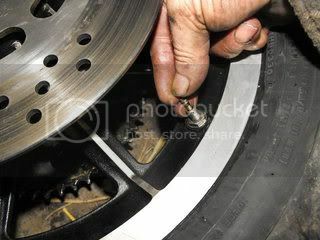 Smear your lubricant around both beads of the tyre. 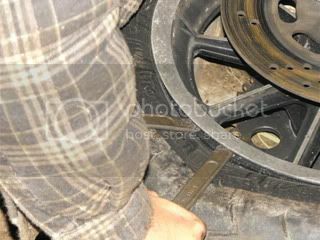 The wheel should virtually fall into the tyre for the first bead. 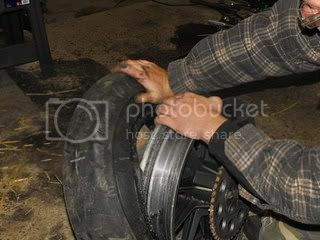 Having got your tyre back on the wheel, the tricky part is getting it to seal, in order to reseat the beads. 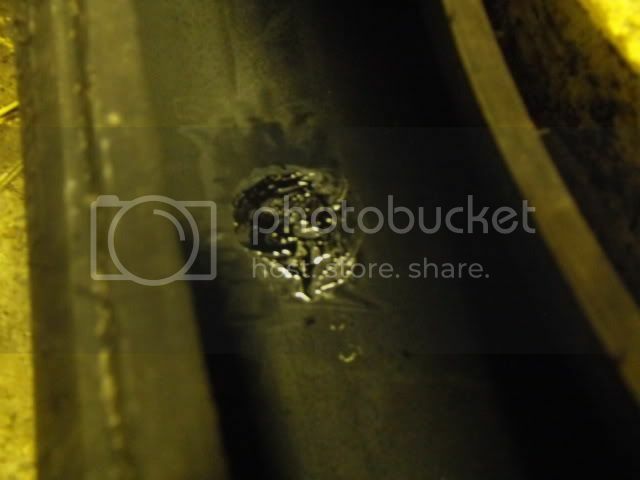 It is best to remove the valve core, if this wasnâ€™t removed at the start of the job. 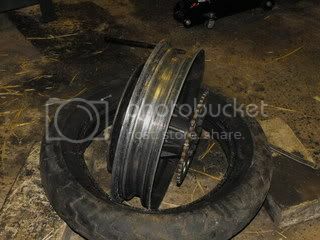 Sealing can usually be achieved by leaning on the tyre until the sound of the air passing the tyre goes quiet, WARNING: ensure there are no body parts or items of clothing likely to get trapped when the tyre seats. 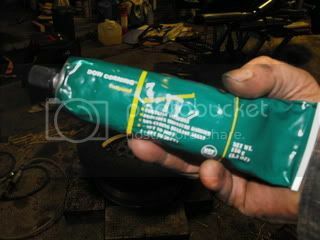 After seating, release the inflator and reinstall the valve core. 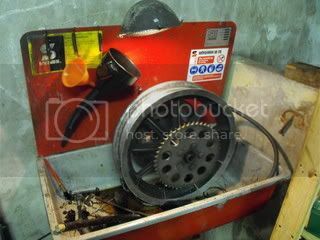 And re-fit the wheel to your machine. 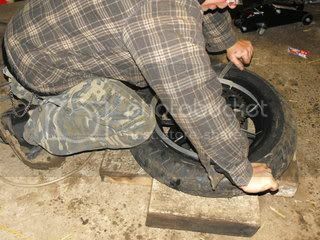 All being well, the tyre will still be inflated in the moroning, ready for that nice ride out, that youâ€™ve been waiting so long for. 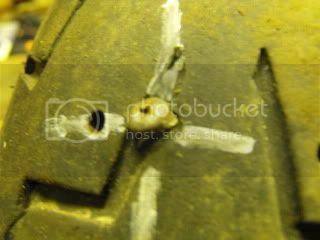 Note: Phots will be reduced as and when my server stops dickin' aboot! Elvis wrote: Thank you very much ! 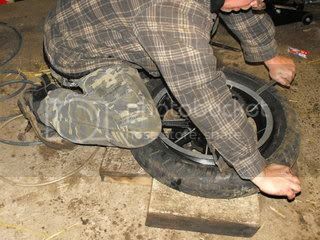 I prefer to use some sort of rim protector when using tyre levers on alloy rims. And a plug rather than a patch. In the absence of proper plugs I've used a bit of knotted string, with a patch on top. It being saturday evening, such things were not available, and as for a piece of string, a frayed knot! 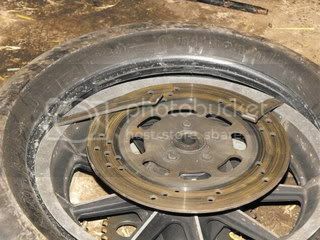 Washing up liquid is not a good idea when fitting tyres, it's not good for the rubber and will cause the rim to corrode. 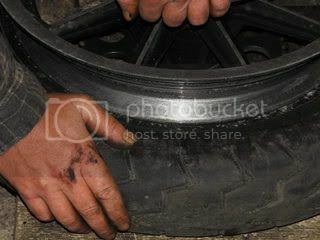 DAM wrote: Washing up liquid is not a good idea when fitting tyres, it's not good for the rubber and will cause the rim to corrode. 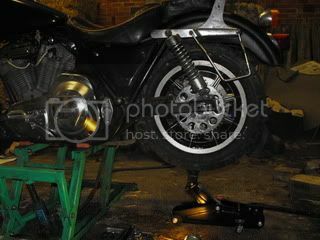 Maybe I don't know what I'm talking about because I've never had tubeless tyres on a motorbike (I thought this was a classic bike forum ) but I always thought that one of the big advantages of tubeless tyres on bikes was that they can be repaired in situ without removing either the wheel or the tyre, using a plug. Am I talking hot air? ?